Remodeling - Rintoul's Leisurescapes - Above Ground, Inground Pool and Landscape ideas for Owen Sound, Port Elgin and surrounding areas. Are you tired of your backyard? Just move in to a house that needs updating? At Rintoul's we have the resources and talent to help you give your tired looking pool a facelift. We specialize in leak detection, landscaping, and installation. Whether you're thinking about change and are working on a budget or just looking for a quote. Contact our knowledgeable staff and they will work with you and your ideas to give you competitive pricing. Who says you have to live with a tired backyard? Let us help you enjoy it again. As a LeisureScapes dealer with a history dating back to 1970, Rintoul's Pools & Hot Tubs is a member of one of Canada's largest professional network of Independent Pool, Spa and Outdoor Leisure retailers and suppliers. Owner Phil Rintoul and the trained staff have a goal of helping customers to create the greatest leisure space- the outdoor living room in your own backyard. 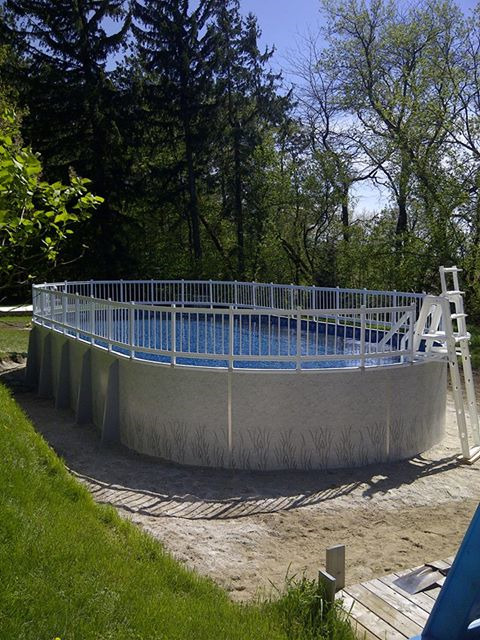 Whether it is the design and custom installation of a swimming pool for any landscape orientation and budget, or maintenance and supplies for an existing pool or Hot Tub, Rintoul's can cover your needs. From free water analysis and expert water management advice to supplies, Rintoul's LeisureScapes provides everything you should need, Including specialty chemical at competitive prices, salt systems, solar heating, and UV sterlizers. Leak detection, liner replacement and repair can be arranged, in addition to weekly pool cleaning and maintenance services, pool openings and closings and hot tub and pool repairs. Create a little paradise in your own yard - visit Rintoul's and make your dream happen this year!